5) Microblading Divider for perfect eyebrow shape. 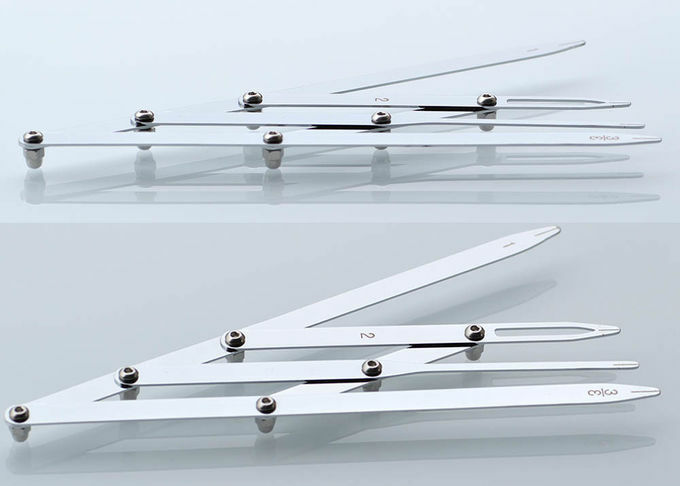 This Fibonacci Gauge is using attractive Stainless Steel material. This tool holds the Golden Ratio constant over the span of its points, and can be used when creating small/medium sized drawings/paintings or patterns in any scale to place objects and components in pleasing proportion with each other and the piece as a whole. The great builders of ancient Greece knew about and incorporated the Golden Ratio in the timeless designs of their wonderful buildings and temples. For example, using the Fibonacci Gauge to inspect a photo of the Parthenon of Athens, you could see the Golden Ratio incorporated into nearly every aspect of that beautiful structure. Similarly, using the gauge to inspect the joints of your arm from fingers to elbow, you can see that the natural spacing of the knuckles and joints also conforms to the Golden Ratio. Similar phenomena occur universally in nature, so the Golden Ratio is considered to be a “natural ratio”. You can tap the inherent attractiveness of this natural ratio by using the fibonacci gauge to adjust the proportions in your own designs…and be pleasantly surprised with successful outcomes. China Good Quality Permanent Makeup Tattoo Machine Supplier. Copyright © 2016 – 2017 permanentmakeuptattoomachine.com. All Rights Reserved.